TV, Radio and Print coverage reached millions through 1,000 radio stations and 1,500 internet stations. Public Service Announcements and interviews on FOX, Salem and Bott Radio networks spread the message nationwide. Members of congress, celebrities, presidential candidates, state legislators, media outlets, and hundreds of patriots lit up social media and proudly displayed our National Motto through their profiles, posts and tweets. Citizens displayed our National Motto through church marquees, billboards, envelope stamps, banners and yard signs. 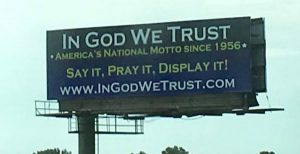 “In God We Trust” events held nationwide, including 12 in Maine alone. Governors and state legislators passed noteworthy legislation recognizing the significance of America’s National Motto including Kentucky, New Mexico, and Illinois. The Pray For America / “In God We Trust” Bus Tour was a great success. Partnering with the National Day of Prayer, we made a bold stand at both national political conventions in Cleveland and Philadelphia, and ended in prayer at the U.S. Capitol in Washington D.C.
Over 1.4 million “In God We Trust” window decals have been distributed and are being displayed on cars, homes, businesses, and churches. Get yours today! Over 60 faith-based organizations partnered with us to get the word out through email and social media. Hundreds of first responder agencies placed “In God We Trust” decals on their police cars and fire trucks. Congressman Randy Forbes made an official statement on the United States House floor. As co-chairmen of the Congressional Prayer Caucus, he and Senator Lankford, acknowledged and supported the National Motto in this Press Release. Sixty years ago, President Eisenhower and the 84th Congress formally made “In God We Trust” our National Motto, and in doing so, publically reinforced one of America’s greatest legacies. It has been referenced by Presidents, inscribed on our currency, and is found in the fourth verse of The Star Spangled Banner. God is acknowledged in the Pledge of Allegiance, and has been a source of hope and confidence since our inception. In this election cycle, religious liberty is being hotly debated in the national dialogue. We must do everything we can to preserve and protect our sacred freedoms. The Anniversary celebration was just the beginning. Be encouraged! Our message is resonating… we will continue the mission to advance Judeo-Christian values and principles. Our goal is to see the National Motto proudly displayed in classrooms, court houses, government chambers and offices, in homes, businesses, and churches… everywhere a flag is flying. Get your “In God We Trust” decal, lapel pin, or t-shirt and take a stand with us. Learn more. Let’s build on the successes of this past week and continue the movement.